There is a lot of folklore surrounding Muskie. The three most common misconceptions are that you have to use really big lures, you have to troll really fast and that fall is the best time for Muskie fishing. These statements are not always true. If you only concentrate on catching Muskie in the fall, then you will only catch Muskie in the fall so it stands to reason why people think the best Muskie fishing is in the fall. The fact is Muskie fishing on Lae Seul is great all summer long. After the ice breaks up and the water starts to warm, the Muskie are thinking about spawning. They usually spawn 2 to 3 weeks after Walleye, which is why the season is closed. They do slow down greatly during the spawn and the females will not eat at all. The season is closed so that time of year does not matter. By mid June the Muskie are back to their normal feeding patterns. Some Walleyes and other baitfish go deeper in the fall, which means less food along the shoreline, which is really the only factor supporting the idea that Muskie feed better in the fall. The fact is many people on Lac Seul catch Muskie while casting for Pike or jigging for Walleye. If you use big lures you will catch big Muskie. If you use lures that are a little smaller, you will catch all size of Muskie. If you troll using a 4.5-inch J-11 Jointed Rapala, you will catch way more Muskie than using an 8-inch Swimwizz but most of the Muskie you catch will be between 34 and 45 inches. Using smaller lures you will catch bigger Muskie once in a while. There is a threshold where a Muskie may reach a size where it can't be bothered expending the energy going after a small bait. So now you have to ask yourself a question. Do I want to have lots of fun catching lots of Muskie or do I sacrifice numbers and try for a big monster Muskie, which are not as common. It all comes down to what you want. If you are new to Muskie fishing, I would suggest you troll with smaller lures to get your feet wet and get a little bit of experience bringing in a few fish before going after the big girls. If you are trolling in an area with a lot of weeds, using big Muskie lures is not enjoyable because you are going to break your arms bringing in big lures every couple of minutes. Try using smaller lures near the weeds. The prime place for using big Muskie lures is in clear weedless water where big Muskie will be patrolling such as river-mouths, rocky points, narrows where Walleyes migrate or in open water off big weed beds or big weedy bays that face the open lake. If you are into casting the weed-lines, your arms will get soar no-matter what so pick any size you want. 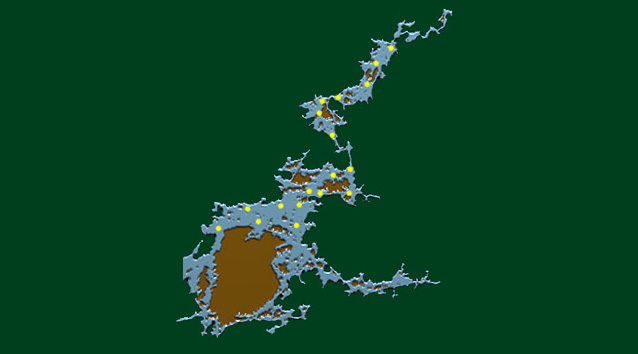 Below is a piece of the Lac Seul Map, which shows that most Muskie like weeds and rocky structure like all fish but Muskie are claustrophobic and tend to like areas facing the larger open areas with weedy bays or narrows behind them. The first place to try is trolling along the weeds or casting into open areas between patches of weeds. Stay on the outside of the weeds that are facing the open lake. 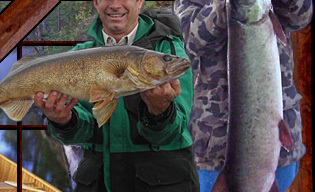 In a lake like Lac Seul, Walleyes like to hand around rocky points. The Muskie will stay in these areas to pick off Walleyes that venture out into open water. Try trolling along the shore in deeper water but not too far from where it gets shallow. 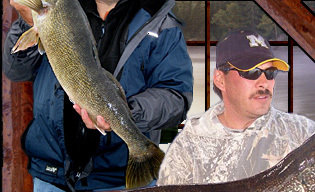 You can also try trolling or casting off river-mouths or the mouth of narrows where Walleye migrate through. Generally, the ideal depth is to have your lure 5 or 6 feet deep in 8 to 15 feet of water. Trolling right along the bottom is great for Walleyes but the Muskie tent to attack fish above them. This is not always true but you will get more strikes in this depth range. In the summer, Muskie are generally solitary hunters. They either sit on bottom, or hide in cover such as weeds or around rock piles. Every Muskie has it's own personality. Some come up from the bottom and strike underneath. 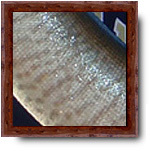 Some Muskie come out of cover and strike from the side. Some Muskie are just swimming around in open water and these are the Muskie that will follow your lure for a long time without striking. The first two scenarios are basically hungry Muskie that hit your lures regardless of the situation. It's the followers that pose the problem. There is an old saying. You only want what you can't have. That saying is never more truthful than when dealing with Muskie. A Muskie that follows your lure is not going to strike until it thinks it's going to lose the opportunity. If you are trolling, don't just drag the lure around. Give your line big jerks once in a while. Every few minutes, try reeling in 30 feet as fast as you can. If nothing strikes, let out 30 feet of line again then when the line pulls tight, give the line aggressive jerks. 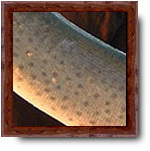 You need to make the lure look agitated, which will trigger a strike responds. If you see Muskie Hunters casting into weeds with Suicks and Jerk Baits, you will see them jerking that line hard. That is to get the Muskie to make a choice. When trolling you have to do a similar thing. Trolling Speed in summer: A good speed to troll for Muskie in the summer is between 6 and 8 miles per hour. That is based on the water being warmer and the Muskie being active. 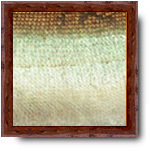 Summer Colors: In the summer Muskie tend to hit brighter and more unnatural colors. Fire Tiger, Red and Chartreuse work the best. There are too many different color combinations to name but generally highly visible lures work best. The reason for this is because the sun and warm water start to grow algae and it affects water clarity. In the fall Muskie have been know to group up into hunting packs of 4 or 5 fish. This is not always true but it does happen. If you are trolling or casting then you would use the same tactics as the summer but when your buddy gets a Muskie on, there is a good chance there are a couple of other Muskie following that fish. Grabbing the video camera or the net is most people's first instinct. What you should do when the fish gets into casting range is lower your drag on your reel and then cast out towards the other fish that your fishing buddy is bringing in. If a Muskie hits the second lure, he will run with it. That's why you lower your drag. Let the Muskie take the line out 30 yards so he is not near the other fish. Then tighten your drag a little to keep him on there and then net your buddies fish. If the Muskie are really hitting that day then don't bother but if you have been trolling 4 hours without a fish, then try to get one while you can. Trolling Speed in Fall: By the time fall comes around, the water is cold. Muskie are feeding a bit more to fatten up for the winter but they are also lethargic from the cold water. With this in mind, try trolling slower then you would in the summer. 4 to 6 miles per hour is a good fall trolling speed. It can get to the perfect speed with a hand held GPS. Fall Colors: In the fall, the water gets colder and the algae start to die. This is when the water starts to clear again and the Muskie's visibility becomes much better. In the fall, it's much better to use natural colors like mixed green and yellow (Perch Color) or gold and browns (Walleye Color). 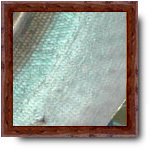 They will also hit silver and black, which mimics silver fish like Whitefish, Cisco, Shad and Lake Herring. Muskie will hit bright summer colors but going to colors that are natural for their food chain is much better. Fire Tiger: When Fire-Tiger first came out in the early 90s, it was the hottest Muskie color ever created. Over the last 15 years so many people were using Fire-Tiger that the Muskie on some smaller lakes have learned to stay away from it. We have not seen any evidence of this on Lac Seul but it is really obvious with smaller Muskie lakes in Southern Ontario. Fishing Line: If you are going to troll, the best line is ultra thin braded. You can buy 50-pound test, which is the same diameter at 10-pound mono. When it comes to braded lines, a higher price does not mean it's better. 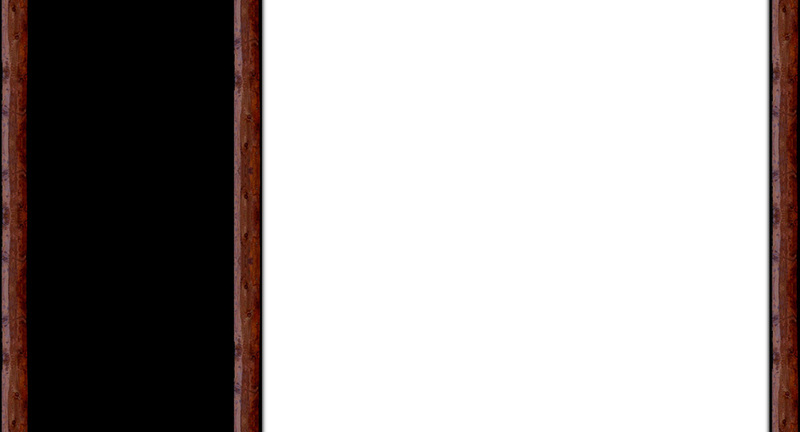 Some of the most expensive braded lines on the market are only good for a week or two before they oxidize. Once they start to oxidize, they lose all their strength when they get wet. I highly recommend Power Pro braded line. It does not oxidize and keeps its strength for a long time. You might only have to change your line every two years while with some of the more expensive brands, the line is finished after a couple of weeks. If you are into casting, braded line is not always best because it's harder to cast. You might want to switch back to a 10 or 12-pound test mono line. If you go any thicker, you might as well use braded. Every lake is different. These Muskie tips are a good place to start. If most of your Muskie fishing experience is on southern lakes, which many times have murky water, you will find you will have to change your tactics in the north. Northwestern Ontario has the best Muskie fishing anywhere on the planet. Very few people with disagree with that. Northern States all have good Muskie fishing as well but they are south of the Great Lakes and experience different weather patterns. Southern lakes do not exhibit obvious Canadian Shield structure and as a result, Muskie methods and techniques in the south do not always work here in Ontario. 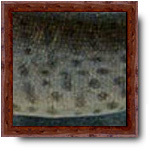 Modern terms such as Muskie or Musky are derived from the word Muskellunge. Scientific name is Esox Masquinongy. The word Muskellunge is actually a modern word derived from the French term Masgue Along�, which is a French trapper's mispronunciation of the Ojibwe word Maashkinoozhe. Maashkinoozhe means Ugly Pike. There is only one species of Muskie but there are 5 distinct patterns, which are known as Clear, Silver, Barred, Spotted Leopard and Spotted Black Panther. Spotted Black Panther is the rarest pattern and sometimes found in Lac Seul. Below are pictures showing the color and pattern variations.